A Patio Enclosure born from Technology, Innovation, and Brilliance. The first patio that becomes an indoor room at the touch of a button. You are about to enter a realm of comfort and relaxation that you’ve never imagined before. Feel all of your senses come alive. LifeRoom isn’t just a room… it’s a total mind-body experience. Feel the soft gentle breeze, let the “Cool Mist Climate System” caress you as the “Smooth Glide Motorized Screens” protect you from the blazing sun’s UV rays and relentless mosquitoes. Imagine, everything you love about being outdoors, with all the comforts of being indoors. Relax, entertain, enjoy… this is your sanctuary… your oasis… a serene haven where you are in total control of your environment. Unique. Innovative. Sophisticated. These words do not even begin to describe the LifeRoom patio enclosure experience. This patio enclosure is so technologically advanced, it makes every room before it look primitive. Imagine… remote control screens, soothing mood lighting, and soft breeze technology. There’s even a cool mist climate system that can reduce the room temperature up to 40° F. This patio enclosure is the perfect addition to your home… and your life. 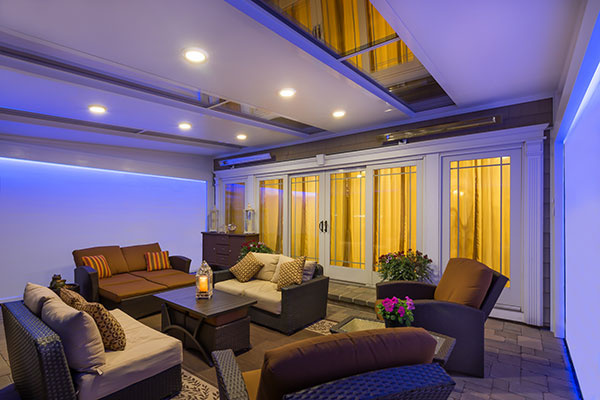 Created to give you an oasis from the stress of everyday living, our LifeRoom patio enclosure lets you escape to a world of tranquility and comfort,to entertain, watch tv, or just relax. The state-of-the-art technology built into this patio enclosure makes it a room for today and tomorrow…at a price that’s extremely comfortable for your budget, too.